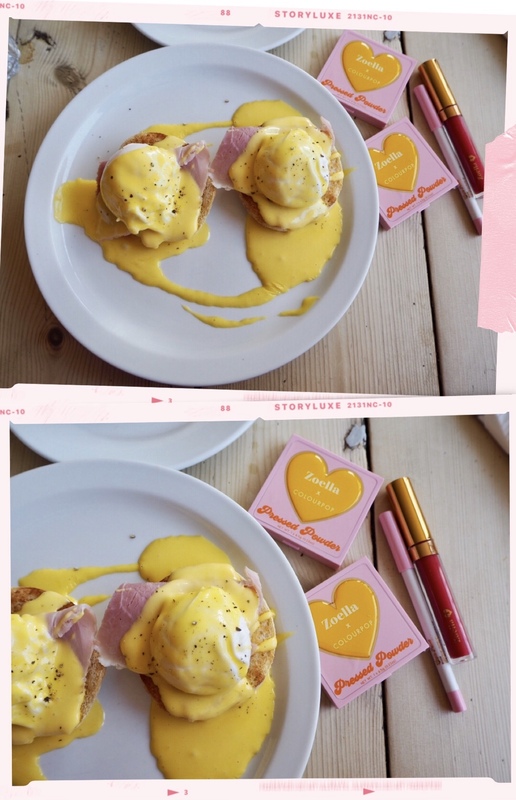 The title of this post is a bit of a white lie as I wasn’t exactly reviewing these products while having brunch, but I’m still pretty pleased with myself for coming up with the idea of photographing some bits from Zoella x Colourpop’s collection with my brunch – the collection is inspired by brunch with your gals so how could I not ‘honour’ that? So, I hope you don’t mind the ‘creative liberties’ I’ve taken with the title – who knows, maybe one day I will go to a coffee shop and literally have brunch while reviewing something for the blog, or even try this concept on video… But for now, here are some pics of the four products I decided to buy from this very easy-on-the-eye beauty collection. I actually don’t really follow British style, beauty and lifestyle vlogger/blogger extraordinaire Zoe Sugg/Zoella, but of course admire what she’s accomplished and can only hope to be half as successful as she is one day! And like I’ve said many a time on the blog, I’m a shameful sucker for beauty hypes. Also, I really do like the American beauty brand Colourpop (I first wrote about them here) and hadn’t bought anything from them in ages, so I was instantly curious about this collection. I watched Zoe’s video (you can watch it here) that focused mainly on this collaboration, and, as a content creator/writer with experience in e-commerce and a little bit of Marketing, I have to say that I loved getting an insight into the whole thought process behind this project. 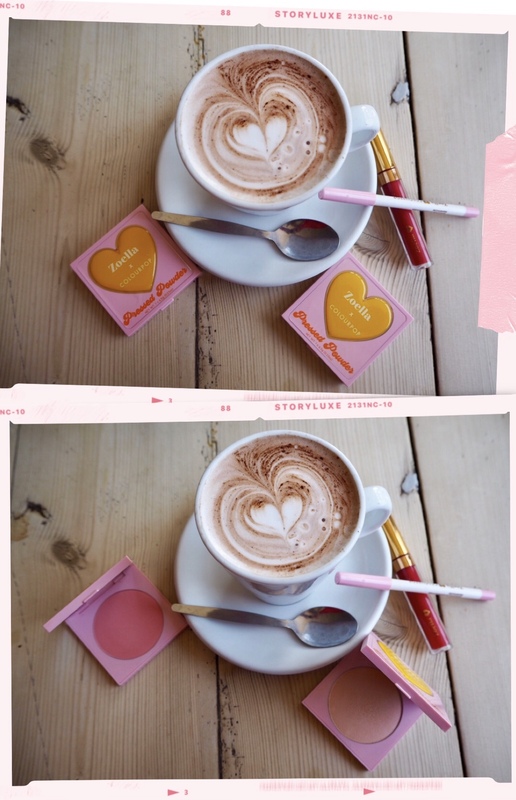 It really does seem like no detail was looked over, and seeing how it was put together – from initially having a Valentine’s concept to eventually moving onto a gal’s brunch date theme, injecting some cute seventies vibes into the collection, choosing colours for the eyeshadow palette and coming up with names for the products – was quite fascinating. I guess you could say that I really don’t mind being influenced when there’s been such a dedicated, creative and well-executed campaign behind closed doors! The collection consisted of quite a few pieces – and if I were a ‘proper’ makeup girl, I’d be all over that sh*t. I think the ‘Brunch Date’ eyeshadow palette looks pretty divine, as well as the individual eyeshadows. 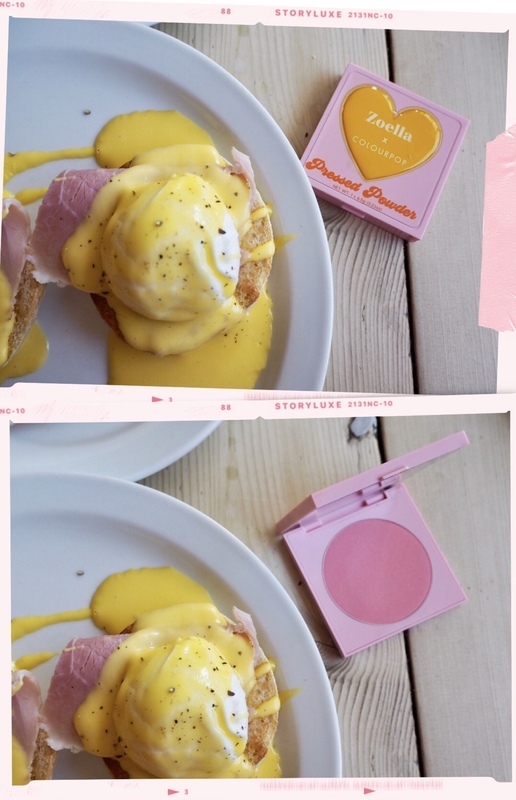 I also ADORE the packaging – as a brunch enthusiast who loves pink and cuteness, it spoke to me. And the milk carton-inspired boxes that the eyeshadows and lip bundles come in are too much. But as much as a part of me would have loved to try every thing, I had to be realistic and shop smart. Firstly, I don’t wear eyeshadow – I’ve been using the same Mac eyeliner for 11 years and that isn’t going to change any time soon. My hooded and super greasy eyelids just don’t take to eyeshadow or any eyeliner that isn’t Mac – believe me, I’ve tried. So as much as I would have loved to try one of the eyeshadows or even the palette, I knew there wouldn’t be any point. Having said that, I really do trust Colourpop as a brand and believe that those eyeshadows are probably the sh*t in terms of pigmentation – it’s my damn eyelids I don’t trust. 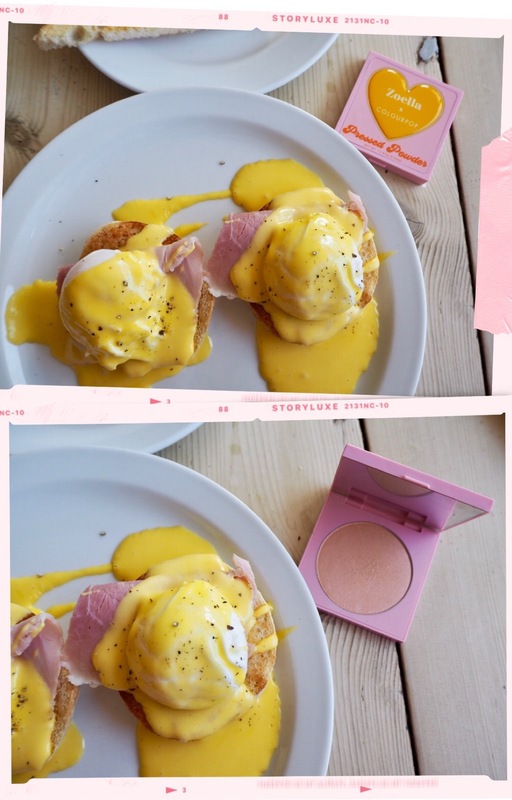 Can I quickly point out how the powders’ packaging matched my Eggs Benedict dish perfectly? OK, back to the highlighter – I probably shouldn’t have bought it, but I couldn’t resist checking it out because I’m a highlighter fanatic. However, I’ve more or less figured out that in terms of hues, I probably favour a more champagne-like, not-quite-gold-but-a-little-gold highlight, and not a pink one. I wish Zoe had come out with something like that – but I guess that’s been overdone, right? Having said that, I really don’t mind how this highlighter looks on me – it’s subtle and very pretty, and I think it would work well with pretty much any blusher. So don’t worry, even though I might not reach out for it every day, I’ll still use it. Available here. Blusher is another thing I just can’t resist, it’s probably the first makeup product I ever really loved. So I couldn’t resist trying this one – even though, like the highlighter, it’s probably a little too pink and pale for me and would maybe suit someone with a fairer complexion and pink undertone. But again, I do like it – I don’t think it looks ‘wrong’ on me (I mean fingers crossed it doesn’t! ), and the fact that it seems to need quite a bit of building up to show up on my light olive skin does stop me from going overboard. Currently sold out! 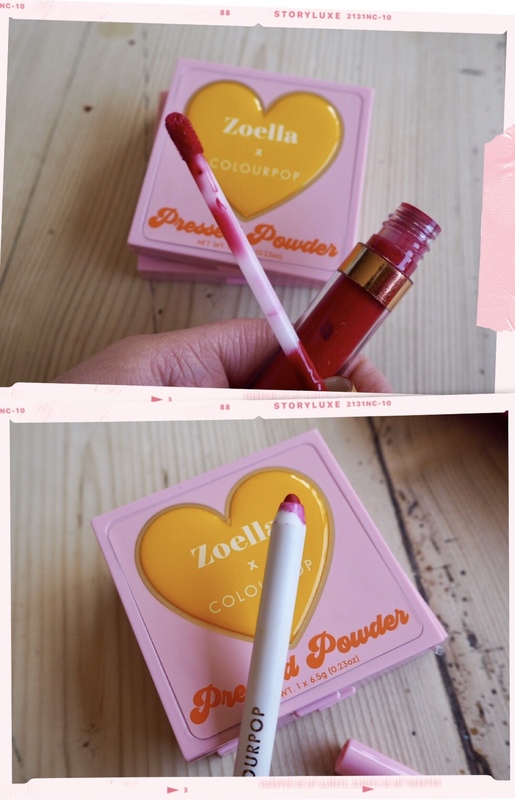 This ‘Lip Bundle’ includes the Ultra Matte Lip in Self Love Club, which is specifically part of Zoella’s collection, and Colourpop’s own Bossy Lippie Pencil – which means both can be bought separately (for $6.50 and $5.00 respectively), but as I used to love wearing lip liner with lipstick I thought I might as well get back into the habit of doing so. I’m glad I did – I love both products, they’re definitely my favourite things out of this little shop. 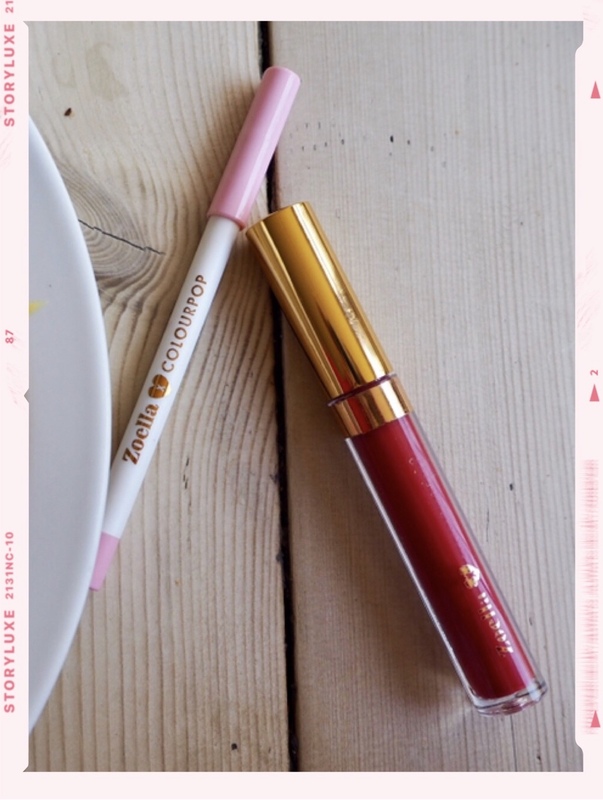 The lip pencil feels smooth and the lipstick’s red hue is lovely – I suppose it’s what you would call a poppy red. It’s cheerful and bright without being too cray cray, and it’s very comfortable to wear. I was a little worried about what the formula could be like – as I explained in this post I did find one of the Colourpop lipsticks I’d bought very, very drying at the time. I don’t know if it’s because of the lip balm I was wearing (Milk Makeup’s KUSH Lip Balm), if there’s been some sort of change in Colourpop’s formula or if my lips have ‘toughened up’ – whatever it is, I didn’t find it particularly drying at all (of course after a few hours my lips do get a bit dry, but they’ve always been quite dry anyway and that happens with pretty much any lipstick). Available here. And here’s how the lipstick looks on! Before brunch, that is – I do need a top-up after the devouring has ended. I am also wearing the highlighter and blusher – and as you can see it’s a pretty subtle effect. Apologies for the pictures not being a little more detailed, I’m not very confident when it comes to showing my dreadful make-up skills! But I hope you can appreciate the blusher and highlighter just a little – I actually like that it doesn’t stand out too much and yet has a nice sheeny/shimmery glow in some lights. Like I said, it would probably show up more on people with lighter skin tones. In terms of durability, I wouldn’t say it disappears completely on me by the end of the day, but blushers and most highlighters do not last on my tricky skin. So there’s one beauty hype I fell for that I don’t really regret spending my money on. It’s cute, it’s cheap, it does what it says on the tin – what more could you ask for? P.S. : I had brunch at Gracelands Cafe – it was yummy, thank you for asking. 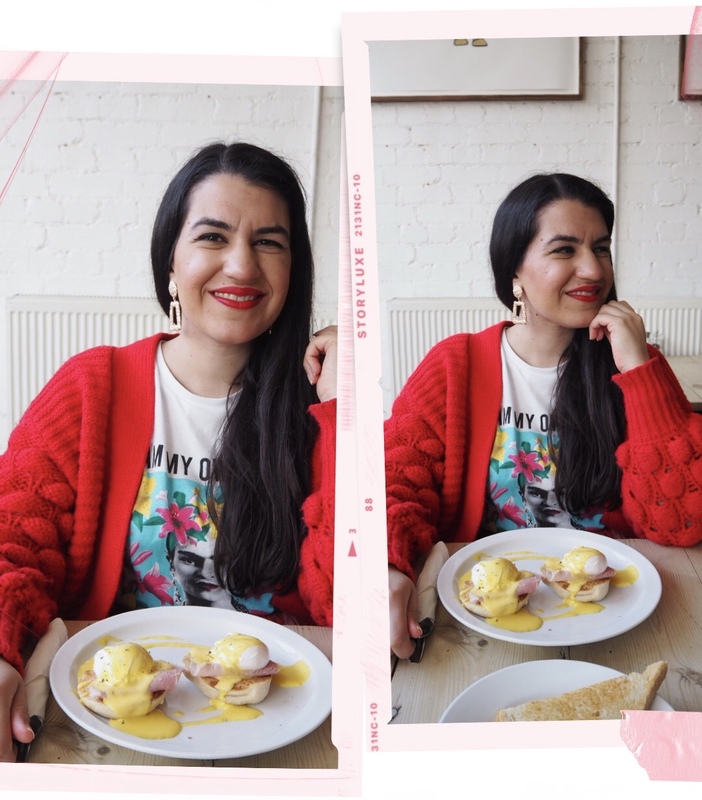 Pictures taken at Gracelands Cafe, Kensal Green, on March 24th, 2019. Next Post Purple Reign: Is Purple Set to be The Next It Colour?